Unfortunately, the onerror event has a major limitation: if an error originates in a cross-origin (third-party) library, the message reported by onerror will simply be "Script error.". In this scenario, let’s pretend jQuery has not yet loaded fast enough before the setTimeout() runs, so attempting to call jQuery() in this init() function would fail. An exception will be thrown, something similar to "jQuery is not defined". var message = errEvent.message; // Script error. The "Script Error." string is given instead of the real error message and does not contain any useful information about what caused the error. In addition, there is no stack associated with the message, so it’s impossible to know where or why the error occurred. As the owner of mysite.com, you can “give access” to the full error information (message and stack) by including the library.js with the Access-Control-Allow-Origin HTTP response header and a crossorigin="anonymous" HTML attribute. Unfortunately, it requires both mysite.com and othercdn.com to opt-in to sharing the full message and stack. The Access-Control-Allow-Origin header is part of the Cross Origin Resource Sharing (CORS) standard. Unfortunately, not all third-party libraries (or the site itself) will be able, or willing, to opt-into this full error information. If not, the error message is stuck at just "Script error.". However, there is a workaround for third-party domains that don’t set Access-Control-Allow-Origin. It may not be practical to wrap every invocation of cross-origin functions. Boomerang includes some helper functions making wrapping easier. This sounds complicated, but let’s see how Boomerang can do this, and how it can benefit error reporting. (Note the actual wrapping is a bit more complicated, see the Boomerang Errors.js plugin for more details). Why does this help? If any exception happens within the callback, the wrapped function’s try/catch is at the top of the stack, so it gets the full error message! This include the original error message (instead of "Script error. "), and the full stack. 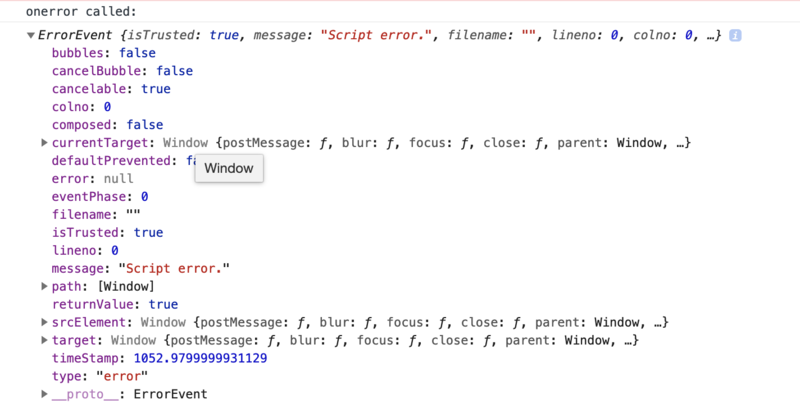 Putting this wrapping in place can help reduce occurrences of "Script error." from third-party scripts within a page, if those scripts can’t otherwise be opted-in via ACAO and the crossorigin="anonymous" attribute. While doing this wrapping to get additional error details for cross-origin scripts sounds ideal, there are some notable downsides to be aware of, as Boomerang being at the “bottom” of the stack may now confuse several well-intentioned tools. Since Boomerang has replaced top-level function such as setTimeout() with its own wrapper function, there will be non-zero overhead when those functions are called and Boomerang’s code forwards the arguments to the native functions. 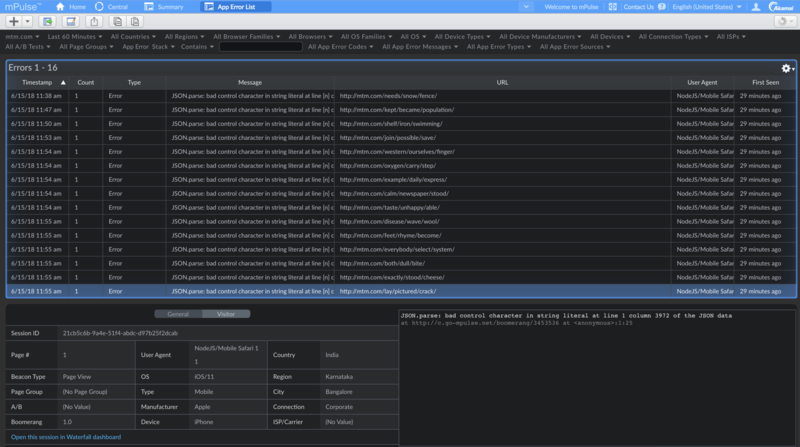 To be clear: Boomerang is not causing these errors, developer tools are just confused because of the wrapping. You can confirm that Boomerang is not the cause of the errors by disabling wrapping. In addition, because Boomerang’s wrapped functions are now at the bottom of the stack, reports such as By Domain might get attributed to Boomerang’s domain (or the root site), instead of third-party libraries. 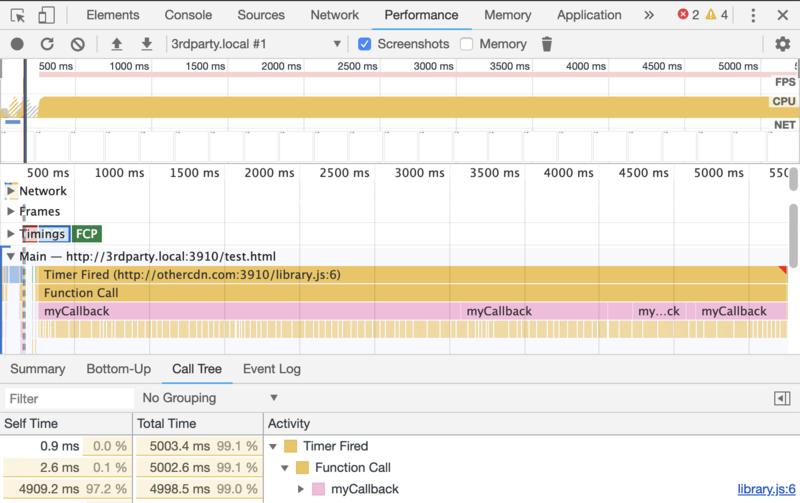 The myCallback() function above is also at the “bottom of the stack”. Due to wrapping, Boomerang’s error wrapping functions are being included in the Total Time. You can confirm that Boomerang is not the cause of the work by disabling wrapping temporarily. When Boomerang’s wrapping is enabled, the wrapping functions often get incorrectly blamed for work being done in other libraries or the root page itself. We have opened an issue with Lighthouse to see if the attribution can be better explained. When run through WebPagetest, we see library-5s.js heavy on the execution for around 5 seconds (according to the pink JS Execution line in the waterfall). 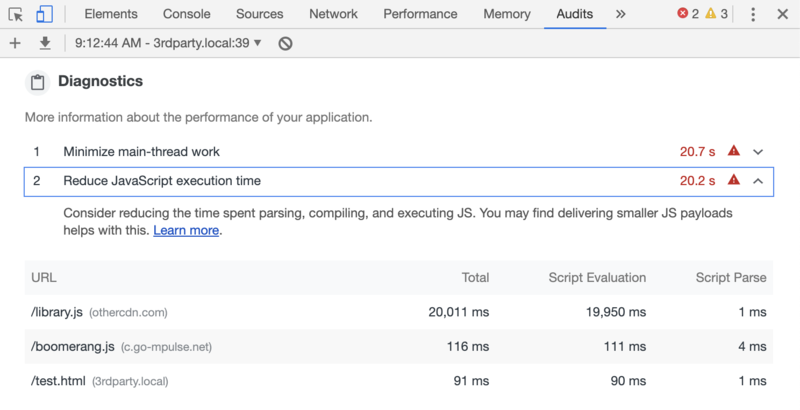 Boomerang’s Error Tracking plugin is a great way to get telemetry on application health. In order to gather better error messages, Boomerang may wrap top-level functions such as setTimeout(), setInterval() and addEventListener(). If the wrapping is causing confusion or concern, you can disable wrapping entirely through the Errors plugin.